New York City is an incredible place to visit any time of the year but there is something magical about how the city transforms at Christmas. 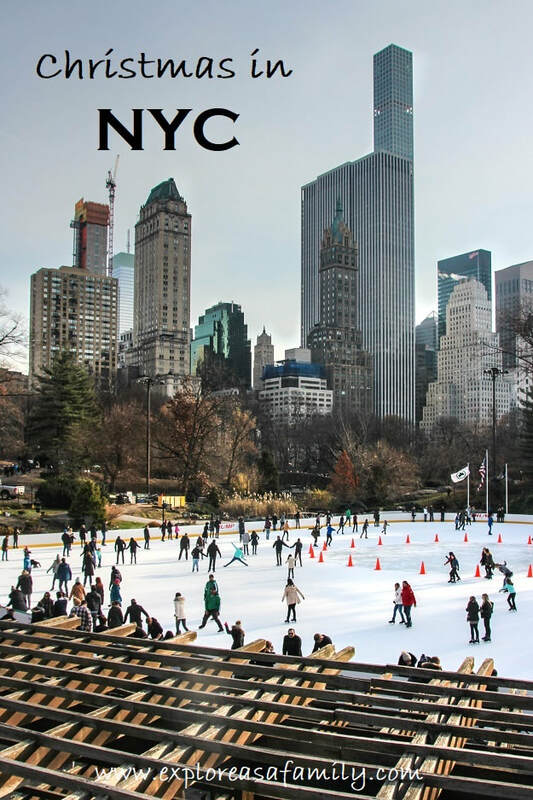 You see it in the movies and on TV: the skaters twirling around the rink in Central Park, New Yorkers on the subway with their parcels, the tree at the Rockefeller Centre and the shop windows all done up; but seeing it in person was so special. While our girls trip (two adventurous women with a 9 month old and 10 month old) only lasted 3 days it was the perfect amount of time to take in the unique sights and experiences that happen between Thanksgiving and New Years with some tourist destinations mixed in! New York offers something for every budget but our girls weren’t old enough to enjoy a show or museum and we were happy to walk around, take pictures and enjoy some cheap eats. We racked up 50 km of walking over the 3 days we were there (thank you Fitbit!) and came home with wonderful memories and some very sore muscles as souvenirs. Here are some tips on what you should check out if you’re in New York around the holidays and a few things you can check out any time of the year! Macy’s is synonymous with the holiday season in New York and it’s definitely the place to go to meet Santa! The lines here can be long but the line is definitely part of the experience! You start by traveling through the train to the North Pole and once you’re there there’s animatronic reindeer, super friendly elfs, a train running through a mountain, caroling snowmen. It is really an entertaining and HUGE space. Our girls weren’t overly impressed with the meet and greet but Santa looked unfazed and the elves let us take as many pictures as we wanted with our personal camera which was an added bonus. Macy’s Santaland is located on the 8th floor of the flagship store in Herald Square. You don’t need tickets but if you want to skip the line, buy an express past. If you don’t buy an express pass, get there EARLY (we waited 75 minutes despite getting there close to opening). ​Almost every department store has its windows decorated with beautifully themed vignettes but our favorite was Saks 5th Avenue. 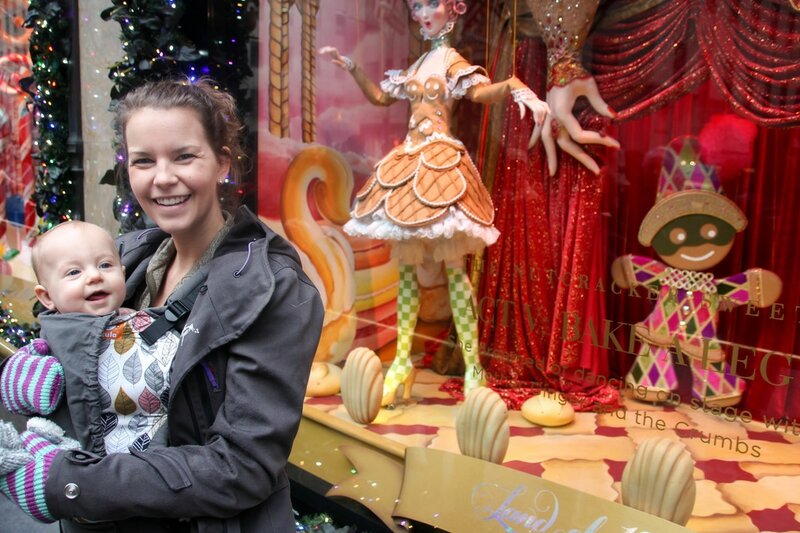 We couldn’t get enough nutcracker themed windows and massive pieces of candy and lollipops around the main entrance. Our little ones were in the carriers which meant they were at the perfect level to enjoy the scenes along with us and they were mesmerized! An added bonus: you line up at one end and walk slowly along enjoying each window without having to worry about anyone jumping in or getting in your way. There is a lights show every 10 minutes from 5 pm until 11 pm. 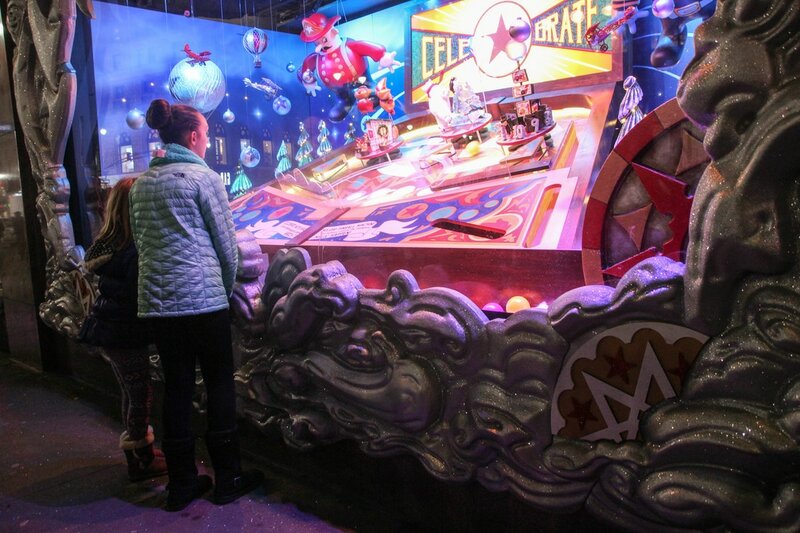 Other window displays, like the ones we saw at Lord and Taylor, and Macy’s weren’t quite as spectacular but Macy’s had the most interactive: a playable pinball machine that was entertaining kids and adults alike! ​Central park is one of my favorite places in New York City. While the warmer months make it the perfect spot to bring a picnic or let your little one run around, we enjoyed walking around, enjoying the sunshine and watching the skaters on the ice rink. We were just spectators but if you want to skate, there is a rental facility and warm place to get laced up and enjoy a hot chocolate afterwards. I can’t wait to go back one day when my little one is older and take her skating. ​This is probably one of the best known symbols of Christmas in New York City. The beautifully lit tree towers almost 100 feet tall and is best viewed by walking up along the Channel Gardens toward 5th Avenue but take your time and walk around the block to see it from all angles and enjoy the skaters on the rink below. You can also head indoors to warm up and grab a bite to eat. ​This is hands down my favorite place in New York City. I have taken the free audio tour in the past (which I highly recommend) and was excited to go back again this trip. 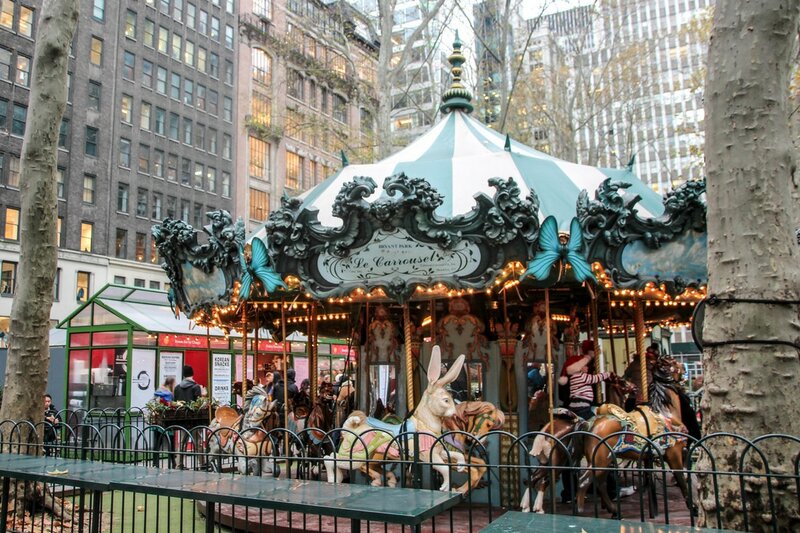 We had spent the middle of the day at Rockefeller Centre, enjoyed the oversized Christmas lights and ornaments along 6th avenue and had taken a ride on the merry go round at Bryant Park. Not only is there space in the Children’s Centre to crawl on the padded mats, and comfy couches where you can feed your baby; you can also see the original Winnie-the-Pooh stuffed animals! 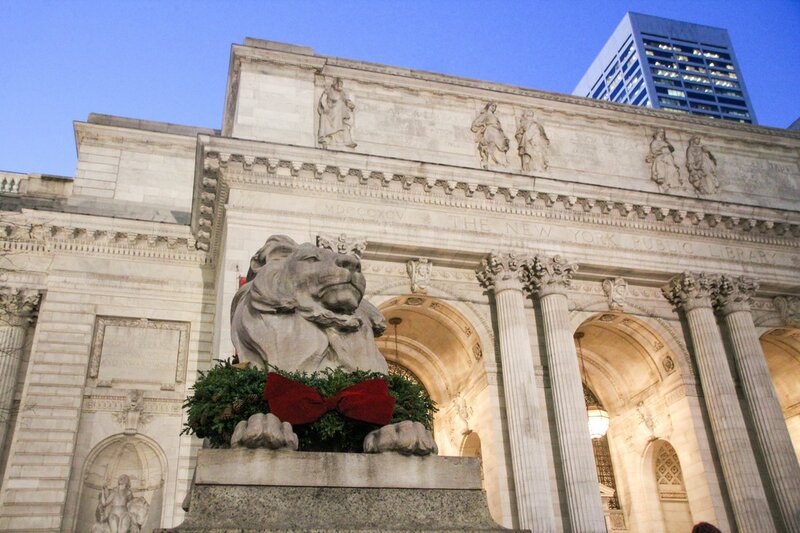 The NYPL is located on 42nd St and 5th Ave and the Children’s Centre is on the ground floor. It is open from 10 am -6 pm Monday to Saturday and 1 pm – 5 pm on Sunday. 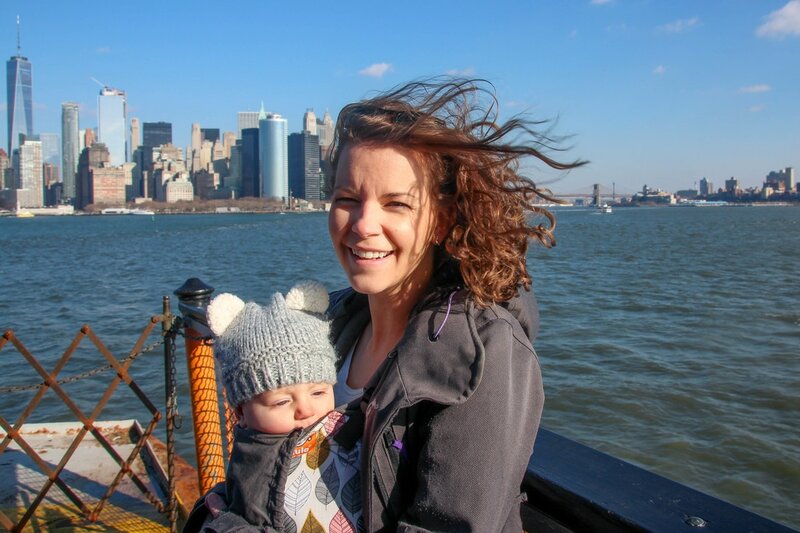 ​We had a little extra time to explore Manhattan on the day we flew out and decided to head down to ride the FREE Staten Island Ferry! 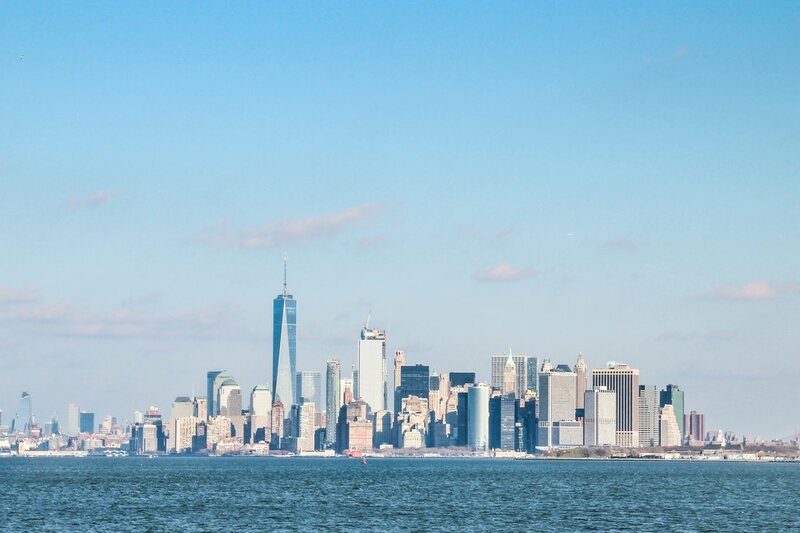 The ferry leaves every 30 minutes from the terminal in Battery Park and travels across the Upper Bay to Staten Island. There you can explore or just hop back on for the return journey. 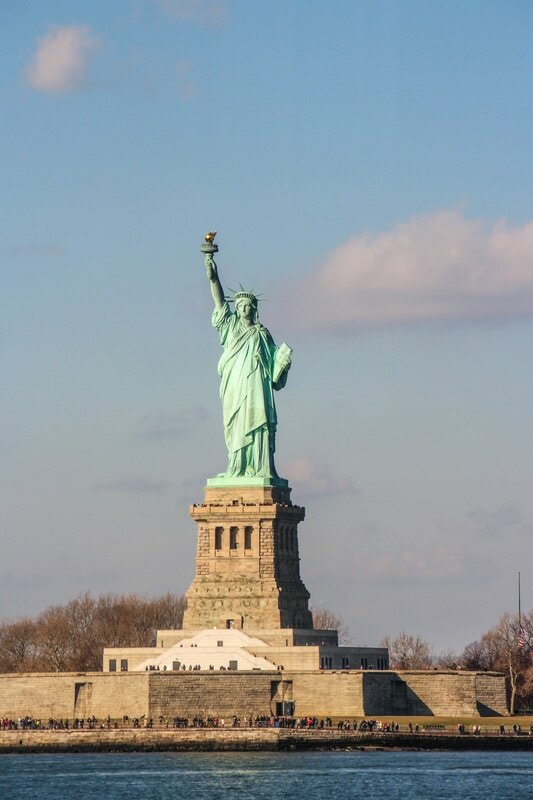 On the way, you pass by the Statue of Liberty and Ellis Island and get a great view of the lower Manhattan skyline. There are lots of seats inside and a deck outside to enjoy an unobstructed view. Keep in mind that this is part of the public transit of the city and used by 70,000 people daily. Avoid the rush hour crowds in order to enjoy the most relaxing trip. ​We had read in our Baby Can Travel guidebook that every Tuesday evening you can pick up free tickets at 4 p.m. which grants you entry from 5 p.m. until close. While the museum was incredible and really moving, it is definitely NOT a place I would bring preschool/school aged children as there are lots of photos, videos and audio that chronicles what happened on September 11th. New York is a fantastic place to visit and every store front, office building, park and fountain seemed to be decked out with lights, sparkle and oversized decorations. It was magical. 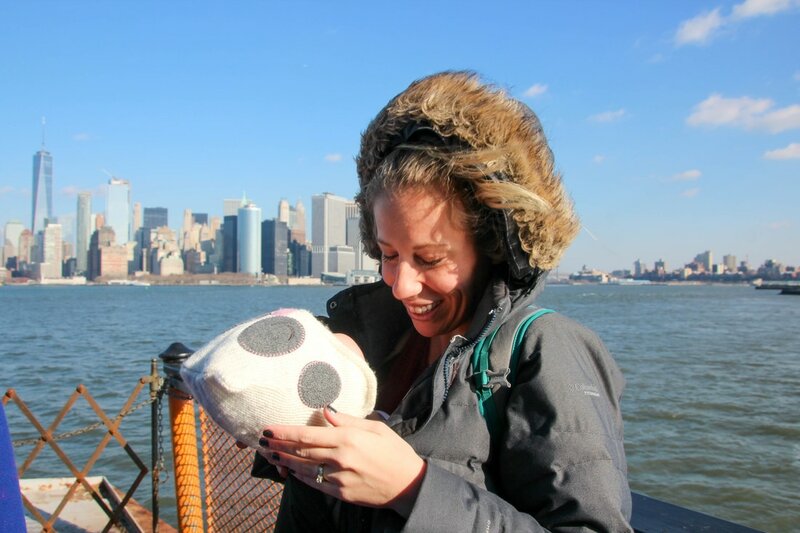 We did find some challenges with traveling to New York with infants, specifically when the weather is cold. We found that bathrooms (in general), and change tables were extremely hard to come by, so were high chairs at restaurants. Bringing your own fabric high chair and changing pad would be super helpful! In addition, we had trouble finding spaces where we felt comfortable letting the little ones crawl around and stretch their legs. Being there is warmer months would have given us the flexibility to find a playground or put down a blanket in Central Park but it was just too cold to have them sitting on the ground outdoors. Our hotel was quite far from the sites we were seeing and so we left in the morning and didn’t return until bedtime. Having accommodations closer to the sites we wanted to see would have made it more convenient to return for a rest midday. A vacation rental would have been nice as well, in order to have two separate spaces to put the girls to bed – two babies and two adults in a New York sized hotel room … well you get the idea. We also wanted to travel light since we were traveling along and so we only brought our carriers. In hindsight it would have been nice to have one stroller between us to switch off carrying the babies and to hold our day pack. We flew on Porter Airlines into and out of Newark. We purchased NJ Transit train tickets at the airport arrivals terminal. We hopped on the skytrain to travel from the terminal to the train station and then took the train to Penn Station. The trip took about 30 minutes and there was staff at every point to help purchase tickets and direct you to the train station. Once we got to Penn Station we walked a couple of block to a luggage storage facility and paid 10 USD per piece to store our luggage for the day. There used to be luggage lockers in Penn Station but due to safety concerns there are no longer lockers at any of the train stations. We got a Roam Mobility SIM card and used a phone to figure out directions (both on foot and by subway using Google Maps), and to use our Baby Can Travel guidebook.